These Instant Pot Scalloped Crack Potatoes were a huge hit in our house! 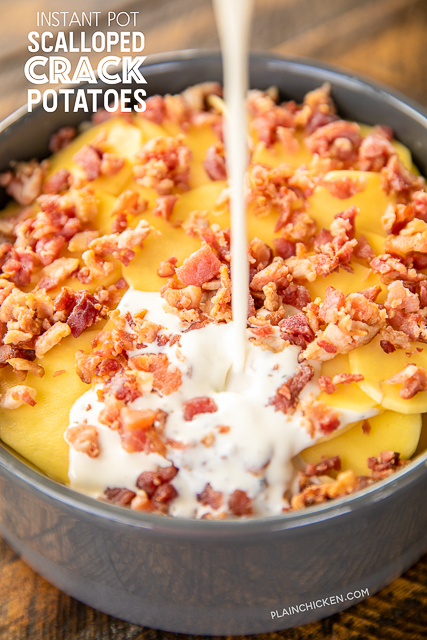 Yukon gold potatoes, bacon, ranch, heavy cream, milk, and cheddar cheese. I mean, what's not to like?!?!? SO simple and SO delicious!!! You will need a couple of special items to make these Scalloped Crack Potatoes. First, you will need 7-inch round pan. A deep dish cake pan would work great. I used a pan I had in my pantry that fit inside my Instant Pot. I also suggest a handheld slicer to get the potatoes sliced evenly and thin. The thicker the potatoes, the longer it will take to cook. 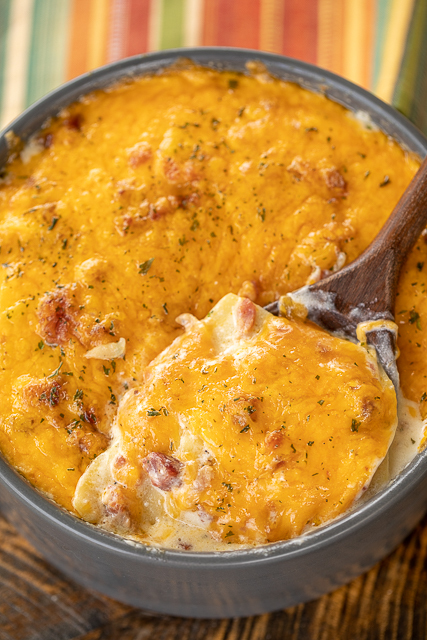 These Instant Pot Scalloped Potatoes are very simple to make. Peel and slice potatoes, layer in baking dish and pop in the Instant Pot. Once the potatoes are cooked, remove them from the Instant Pot, and add more cheese!!! YASSS! Finally, pop the dish under the broiler for a minute to melt the cheese. Done! There isn't a lot of hands-on time. The Instant Pot is really doing all the work. We absolutely LOVED these Scalloped Crack Potatoes. SO cheesy and delicious. These potatoes are great with just about anything - chicken, pork, steak, burgers. We've made these several times and just can't get enough of them. They are on the menu again this weekend! YUM! Whisk together heavy cream, milk and Ranch seasoning packet. 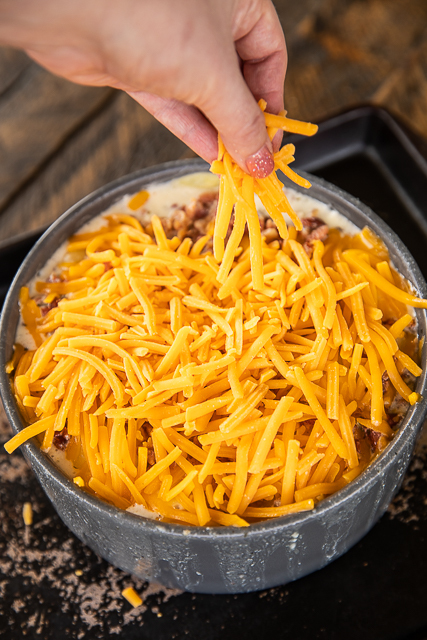 In a 7 to 8-inch round deep dish pan, layer half of the potatoes, half of the bacon and 1/2 cup of cheddar cheese. Pour half of the milk mixture over potatoes. Repeat layers. Place trivet in bottom of Instant Pot insert. Add 1-1/4 cups of water to Instant Pot insert. Place the round pan on top of your trivet. Close lid and make sure pressure valve is sealed. Cook on HIGH pressure for 40 minutes. Open the pressure valve for a quick release of the pressure. Carefully remove pan from Instant Pot. Top with remaining cup of cheddar cheese. Broil in oven until cheese has melted. 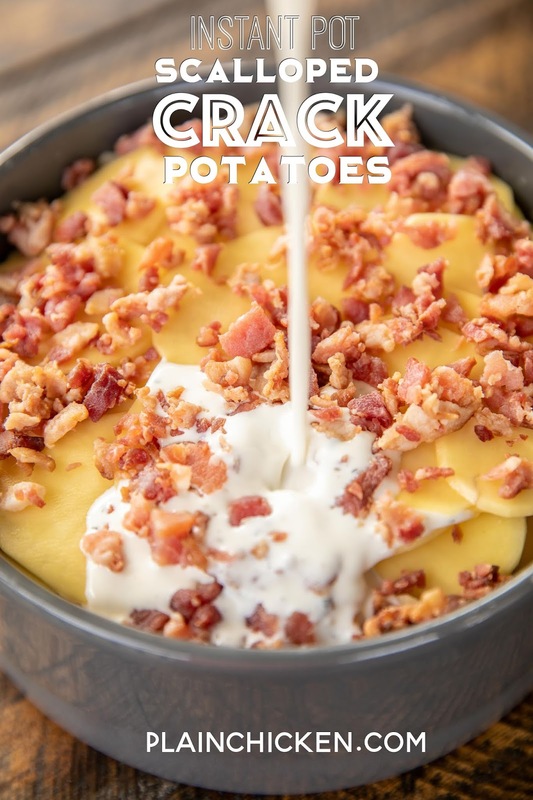 Sounds amazing - i love scalloped potatoes! Sounds good. How deep is your 7” pan, please. Wondering if I can use my springform pan. Thanks! How long should One bake this in the oven, in the same shape pan? I am not sure how long this would bake in the oven. I have only made this as written. I would need to do more recipe testing to determine the oven time. I believe you could easily cook it in the oven. Cut the potatoes thin and cover with foil. Cook on 350 for about 45 minutes. Fork test the potatoes. If done, remove foul and leave it just long enough to let cheese get a little color!